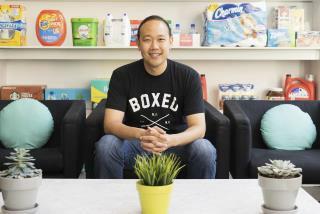 (Newser) – When Boxed co-founder and CEO Chieh Huang first pitched his unconventional and highly generous benefits plan to investors a few years ago, some said, "What the hell are you doing?" His company, which takes on the likes of Costco to offer low-cost online bulk purchases with two-day delivery and no membership fees, employs not just engineers fine-tuning a profitable formula, but warehouse workers packing the shipments. And he wanted all of them to have the same awesome perks, like unlimited parental leave and free weddings and tuition, reports Bloomberg. As Huang puts it, why should the "people who move atoms" be treated worse than those who "move bits and bytes"? He's anti-dehumanization. He's basically saying all his employees are people that have value to his company, as well as to society as a whole, regardless of what tasks they perform. Free wedding and tuition? Seems way generous. Is it sustainable would be a question. Decent wage and superior healthcare would be enough for most. A respectful management would be a plus also.